For low flow rates, coil type exchangers are more efficient than shell and tube exchangers. Due to their simple design, they are also inexpensive to manufacture and easy to clean shell-side. Their efficiency is usually close to that of the ideal counter-flow thanks to the operation mode. 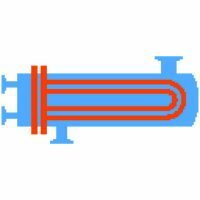 To guide the flow, the coil heat exchanger can be equipped with a displacement cylinder or can also be designed without a displacement cylinder. The coil may consist of a maximum of 5 parallel flown-through tubes. Shell-side flow is always forced flow. Flow direction can be countercurrent or co-current. The media are single-phase (liquid or gaseous) or condensing pure substances (pure substance condensation, isothermal condensation). The properties of the media used are provided by LV properties modules and calculated for the mean temperatures and pressures. If desired, the program only calculates with standard tube and jacket dimensions (standard values). This enables the designer to use only standard semi-finished products, thus optimising costs and delivery times and reducing inventory costs through a limited range of materials. The condensation of multi-component mixtures cannot be calculated with COIL.